SPRINGFIELD, IL – Youth and adult hunters can now apply for 2019 Spring Turkey Hunting opportunities through the Illinois Recreational Access Program (IRAP). 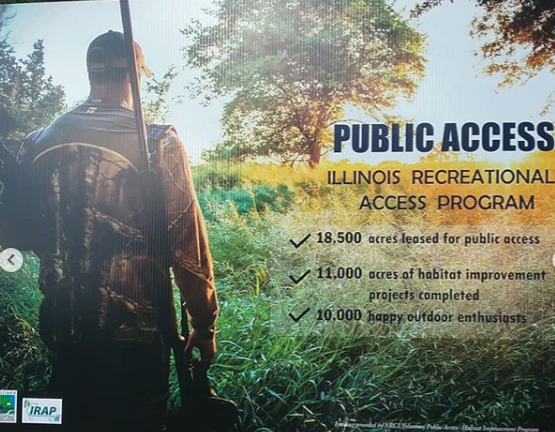 The Illinois Department of Natural Resources (IDNR) has leased about 15,000 acres of private land on more than 170 sites in 39 counties for 2019 spring turkey hunting. Public access on the hunting sites is available free of charge for the two-weekend youth season, which will be held on March 30-31 and April 6-7, 2019. Individuals must be under 18 years of age to participate as a youth hunter. To be eligible for the youth drawing, individuals must fill out an IRAP application and return it by February 26, 2019. Applications for IRAP turkey hunting sites can be found online at https://www.dnr.illinois.gov/conservation/IRAP/Pages/First-time-Adult-turkey-hunting-.aspx. Successful applicants will be notified by mail regarding the location of their hunting site, and they will be given a map and an IRAP site permit allowing them to hunt on their assigned privately-owned turkey hunting site. For youth season, hunters will also need to purchase an over-the-counter IDNR youth turkey permit after they have received their IRAP site permit packet. The IRAP program is funded through a grant from the U.S. Department of Agriculture’s Natural Resources Conservation Service. To date, IRAP has leased more than 19,000 acres in 46 counties to provide for various public access opportunities such as turkey, archery deer, small game, waterfowl, and upland bird hunting; pond and riverbank fishing; boat access on public waterways; and, access for hiking, birding and outdoor photography.